The curious dichotomy of the 2009 Detroit auto show is that, while the showmanship has diminished from years past (no Dodge Ram cattle drive past the Cobo Center this year, for instance), in other ways the hype is still at an all-time high. This year, automakers are doing all they can to paint themselves as the greenest automakers in town. The result is tangle of fact, fiction and flat-out lies that can be tough to decipher. Some start-ups and established manufacturers are unashamedly exhibiting science project cars purportedly running on electric power and promised for the not-too-distant future. Others are making concrete advances, showing actual production hardware that will be in dealer showrooms in coming months, selling for prices regular consumers can afford and in volumes that can start to make a difference to drivers aiming to save on gasoline. Of course, the reception these new models receive when they reach showrooms will be colored by the current price of gas. “If all of these [cars] were introduced in last July’s fuel climate (consumers) would be delighted,” remarked Lindsay Brooke, senior editor for Automotive Engineering International magazine, an industry trade journal. With gas prices falling, consumers have returned to their old habits, and the U.S. market share for small and fuel efficient vehicles, which rose to 25 percent in the summer as gas prices spiked, has now returned to their pre-summer level of about 15 percent, reported Jim Farley, Ford vice president of marketing and communications, who joined the company from Toyota. The leader of the hybrid movement, both in popular perception and in claimed fuel economy, is the all-new third-generation 2010 Toyota Prius, which the automaker unveiled for the first time Monday. Toyota predicts the new sedan will achieve a combined 50 MPG on the EPA city and highway cycles. That compares to 46 MPG for the older model. In an approach that would evoke scoffs from skeptics of domestic manufacturers, the new Prius uses a larger-displacement 1.8-liter inline-four-cylinder engine to achieve improved highway fuel economy. The bigger engine doesn’t work as hard and can spin at lower RPM, so it uses less gas at highway speeds and during cold startup times when the Prius must bring the gas engine up to operating temperature before it can begin its electric-only operation. 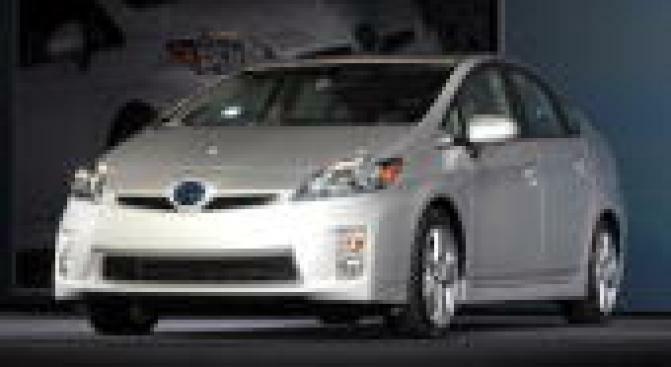 The new Prius is also quicker, accelerating to 60 MPH from a stop in 9.5 seconds. “A little larger engine displacement allows a state of tune that lets [Toyota] reach a compromise for a little better efficiency and power,” observed Kevin Smith, editorial director for Edmunds.com. By increasing its power, Toyota said it was responding to complaints from current Prius owners that the car is sluggish, but “I don’t imagine that a lot of prospective Prius buyers are very concerned with zero-to-sixty times,” Smith concluded. Building on its experience with hybrid technology, Toyota was able to shrink the electric hardware under the hood of the new Prius, whittling away 20 percent of the weight of the electric power inverter, motor and transaxle. The car itself is incrementally larger, but the company was able to pack an extra five cubic feet of cabin space inside, thanks in part to moving the roof peak back a few inches. This increases headroom inside and smoothes airflow outside because of the resulting “wedgier” shape. Toyota predicts it will sell 180,000 of the new Prius in the U.S. each year, topping the 160,000 unit-high watermark of the previous version. The car goes on sale in the spring and the price has not yet been set. On Sunday, Honda officially unveiled its Insight hybrid model which observers noticed bears a strong resemblance to the Prius. That’s because both cars were shaped by the same dictates of minimal aerodynamic drag and maximum cabin space rather than an attempt by Honda to ape its Japanese rival. The Insight’s hybrid design is philosophically different from Toyota’s, functioning as a primarily gas-powered vehicle with an electric assist motor, a layout that produces better highway fuel economy than city mileage. The Insight also has the potential to cost less than the Prius because it uses a smaller battery and electric motor. As with the Prius, Honda has not announced the price of its new Insight, but said that it will be below that of its Civic hybrid, so look for it to start around $20,000. Ford, meanwhile, applied an electric-heavy design to its new Fusion hybrid, which the automaker is showing this year in Detroit. The car is aimed to compete more directly against the Toyota’s Camry hybrid rather than the Prius. The hybrid Focus features a 2.5-liter four-cylinder engine designed to give the car muscle on the highway, but its city-centric electric drive system is so efficient that its regenerative braking system recovers 94 percent of available energy, according to Praveen Cherian, Ford’s hybrid project leader. As a result, Ford claims the Fusion hybrid can go more than 700 miles on a full tank of gas in city driving conditions. Why is the Fusion hybrid’s drive system so efficient? It’s critical to size the hardware correctly, said Cherian. With the right hardware in place, the software programmers spend countless late nights perfecting its operation. Hybrid technology might not be here forever. It is a “bridge” technology meant to help consumers move from gasoline to electric power in a world where there is no electric infrastructure yet in place, said Kevin Smith, editorial director for Edmunds.com. “How long that bridge will be remains to be seen,” he added. Ultimately, pure battery-run electric cars and fuel cell cars should displace hybrids, once the necessary infrastructures are in place to support them, Smith said. Ford announced plans to sell a pure battery electric van to commercial customers in 2011 and it promises to offer a car to retail consumers in 2012. However, for some time, electric vehicles running on batteries will be marginal because of limited range and opportunities to recharge them. Tesla showed its battery-powered roadster in Detroit, but it costs just over $100,000 and so it’s not a practical solution for the near future. Exotic car maker Fisker Automotive and two Chinese car manufacturers — Brilliance and BYD — also showed electric cars which seem unlikely to have a dramatic effect on mainstream consumers. Even Chrysler resorted to offering some not-terribly practical solutions, showing an all-electric two-seater based on the same Lotus platform as the Tesla. For now, it seems, car consumers must still dream of a future unshackled from the vagaries of gas prices.